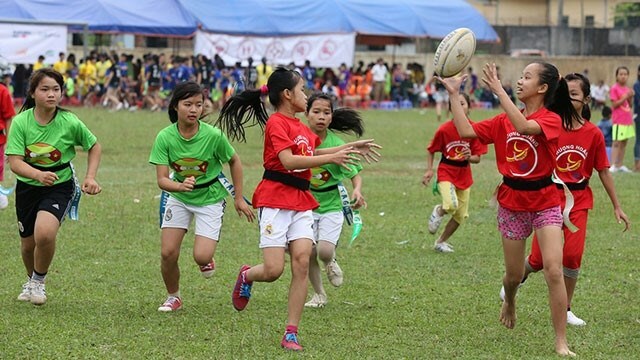 Hanoi (VNA) – Vietnam’s disadvantaged children will be provided with soft skills like communication, leadership, support, and settlement of negative pressure and contradiction through the “Pass It Back” programme, which uses rugby to build resilience among young people. The programme is developed by the ChildFund Australia, a non-profit organisation working for poverty alleviation for children in developing countries, as heard a press conference in Hanoi on August 15. Under the “Pass It Back” curriculum, children and young people with little or no access to organised sports will be equipped to overcome challenges, inspire positive social change and pass it back to their communities. According to Deborah Leaver, Country Director of ChildFund Vietnam, the sport brings a new approach to promote gender equality as there is no rule about gender of the players. Thus, the programme will help boys and girls have equal opportunities to develop life skills. She said her team, with 6 players, would set off for the Asia Rugby Championship in Iceland on August 16.